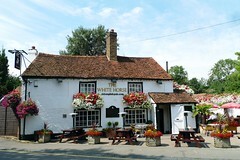 A very old pub just outside the perimeter of Heathrow Airport in the village of Longford. According to a sign on the pub photo, the building may date back to 1534, but it was definitely functioning as a pub by 1601. Aside from the regular and periodic roar of jets taking off from the nearby airport, this is situated in a pleasant and quietly leafy little village. From Ewan's Thursday lunchtime visit, the clientele are largely locals and staff of the the nearby British Airways headquarters. As the sun was out, many of the outdoor tables were taken, but the inside was empty aside from a few drinkers at the bar. Music from a fairly upbeat radio station was playing both inside and outside, but not too loudly. There are two buildings. The main pub building has two low-ceilinged rooms, with a bar at the back running between both rooms. The rear bar is called the Barn Bar photo, also with a low entrance (and appropriate warning sign), though it feels more spacious. On Ewan's visit, this was the only area of the pub with any sign of life (the main pub was laid out for dining and no one was in it on either side of the bar). Outdoor seating is mostly on large comfortable chairs along the side of the pub in front of the Barn Bar, though with a few picnic-style tables closer to the street. There are two handpulls for ale on each side of the bar in the main pub, as well as another two in the Barn Bar. The three ales on offer were Fuller's London Pride, Wells Bombardier and Young's Special Ale, as well as a selection of standard lagers including Peroni. The Young's (£4/pint) was well-kept. Food is served lunchtimes and evenings, according to the 2010 Good Beer Guide. The menu is a lavishly illustrated multi-page booklet with breakfast, fish, meat, burger, pasta and other options, all pub food staples and priced around £10-£13 for mains. Ewan tried the breaded plaice with chips and mushy peas (£13) photo, which was perfectly decent, and served with plenty of chips as well as a nicely-dressed side salad. Last visited by Ewan, August 2013. Opening hours taken from website, August 2013. Last edited 2013-08-08 21:18:59 (version 4; diff). List all versions. Page last edited 2013-08-08 21:18:59 (version 4).